Farming versus mining: Is the Andrews Government the new "country" party? Abandoned by the Coalition's misinformation on coal seam gas exploration, Victorian farmers have found a new political ally in the Andrews Labor Government. Tracey Anton reports. HOW CAN VICTORIA balance economics and the environment from extracting earth resources when the full risks and costs are deliberately hidden from the public? Right now, Victorians do not need a manipulation of the facts — and we sure as hell do not need more fossil "fool" spruikers confusing Victorians with misinformation. The impending closure of Hazelwood Power Station has brought out the naysayers in droves, with former Liberal Premier Jeff Kennett at the forefront and the current crop of Coalition members playing petty politics with our State's energy future — all while ignoring how dangerous Hazelwood power station actually is. My favourite example was at an event I attended in Latrobe Valley on 29 July, when Dr John Hewson presented a rather dubious use of our Federal superannuation funds — to invest in refining coal with hydrofluoric acid. This story and his other investment angles also featured in RenewEconomy but the referenced video has mysteriously disappeared. All landowners want is water security and surety of land tenure, but all we get from the Coalition is more of the same which, for Victoria, is regressive and corrupted policy, and politically manipulated legislation. When these two are in conflict with the environment, or in opposition to rational resource planning, this is where the balance of the cost or risk to the person and the State is at its greatest. All resource extraction pits the farmer against the miner in competition with groundwater, but no one is sticking up for our rights to water entitlements in a predicted drier future. Nor do they care about land degradation or contaminating the air that we breathe. The Coalition, both State and Federal, has bastardised farming, holding our lands to ransom. Even the Victorian Farmers Federation (VFF), traditionally a voice for the farmer, has abandoned its grass roots protection and now sees its executive as a National Party breeding ground into politics, controlled by Liberal Party policy and condoning locking up our precious farmlands. 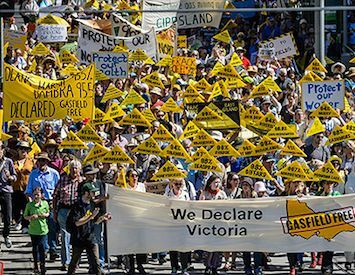 If the Victorian National Party and the VFF are not speaking up for the land, then who is? Is Labor the new "country" party? The whole question of resource extraction is about "risk assessment". Science is only employed in a cursory attempt at defining a predictive model that can go some way to allaying fears of what might happen. Economically, mining is based on a flawed economic model, in the absence of full cost analysis, where the impact on the environment is given no monetary worth and people are collateral damage. The fossil fuel industry needs massive government subsidies to survive and be viable, with huge profits going to shareholders, while the little people and future generations suffer the impacts. The Andrews Labor Government, with ministers Lily D’Ambrosio and Wade Noonan, concluded the second reading of the historic Bill to permanently ban onshore gas in Victoria, with debate to continue in the new year. It is a great relief for farmers. Daniel Andrews is leading Australia with commonsense and forethought, as the geological formation for Gippsland and the Otway Basins do not support the evidence that commercial quantities of gas deposits exist. It’s the same scenario for onshore conventional drilling, but mining lobbyists, APPEA and MCA, are just not coping with the truth being told. We have no commercial quantities of gas in Victoria but we have exploration — it's one hell of a Ponzi scheme. … the renewal of exploration permits is each a matter of governmental discretion and no guarantee can be given in this regard. Even though the "big" gas is not there, we now have Jeff Kennett ranting "rethink the gas ban". Victorians well know former Premier Kennett’s ruthless governing with a focus on hard-line economics. No wonder Minister for Energy, Environment and Climate Change Lily D’Ambrosio is dismissive of Kennett’s opinions when he ignorantly tried to play the government on why Hazelwood owner, Engie, should convert its energy source to gas, ignoring Engie's already stated view that the option proved unviable. Next, Kennett declared Victoria would lose its capacity to produce base load generation, which is deliberately misleading. But the best Kennett clanger was to build two nuclear plants in the Latrobe Valley — the most ill-informed idea Kennett has come up with to date. Hazelwood sits on the active Morwell fault line, with an earthquake risk profile of an assumed maximum earthquake magnitude of 6.0 in the next decade. Kennett's views – and current Coalition policies – continue to be the biggest risk to the individual, the environment and the Victorian taxpayer. Unfortunately, this is what we have come to expect when the Victorian Coalition is devoid of any progressive energy policies and full of hysteria laden energy alarmists mimicking their Federal counterparts. Add lazy journalism, particularly from agricultural papers that are more sympathetic to the miners than accurate reporting and what hope has the ordinary person to know fact from politically induced fiction. Our Gippsland waterways are now putrid compared to the 1970’s, before the coal industry grew and our main Latrobe aquifer is depleted from decades of resource extraction. For nearly 20 years, water has been accorded a lower order of priority over the extractive worth of mining. The existing Gippsland subsidence was ignored by Kennett in the 1990s, undermining our communities. This is manipulating legislation and regulations based on his ideology to privilege one industry over another while the Gippsland Nationals did nothing. In my opinion, the National Party are the laziest and most irrelevant political party in modern politics, preferring to dine with the champagne set for own self-interest, saying yes to all that comes out of the Liberal Party policy room. Even their onshore gas campaign on "right of veto" is a joke, because it means that mining has been approved in the first place. As Victoria sits on the cusp of much-needed energy innovation, it is Labor leading the way to clawback entrenched past mismanagement plagued by corrupt political interference and poor leadership. For political transparency, all Victorians should know the clear link between the miner’s self-interest and the subsequent drain on public finances, otherwise we will always struggle to achieve any form of cohesive transition for Victoria’s energy future. Good on Labor for beginning to right the wrongs; shame on the Coalition for continuing past wrongs to deny progress. You can follow Tracey Anton on Twitter @COM_TraceyA or on her blog Community Over Mining or on Facebook.